FEMA and ARRL Sign Agreement; FEMA Administrator Calls Ham Radio "Resilient"
part of Amateur Radio history, the League's second century has arrived! The ARRL welcomed some 3300 visitors to the Connecticut Convention Center in Hartford for the 3-day event, which went smoothly for the most part, said ARRL President Kay Craigie, N3KN. She noted that many conventioneers even stayed around for the official closing ceremony on Saturday afternoon -- and beyond. "Even as late as Sunday, people were shaking my hand at the convention hotel and saying how much they enjoyed the convention," Craigie said. "Despite a few hitches and glitches, the event as a whole met our objective of being a truly memorable and meaningful celebration of the centennial, in the city where it all began 100 years ago." At ARRL's "Discovery Station" in the Convention's Exhibit hall, presenter Larry Kendall, K6NDL, demonstrates basic electricity and electronic principles for Shannon Fitzgerald. Craigie expressed appreciation for the efforts of ARRL Headquarters staffers and the many volunteers who helped to make the convention a success. "The ARRL also appreciates the Training Track and forum presenters, who made the program as fine as anything ever brought together for an Amateur Radio convention," she added. "The exhibitors who supported the show with their presence gave visitors an excellent opportunity to learn more about the products, services, and organizations in today's Amateur Radio. That was really helpful when I walked through the exhibits with FEMA Administrator Craig Fugate, KK4INZ, and later with Congressman Joseph Courtney of Connecticut -- an original co-sponsor of HR.4969 -- for some show and tell about Amateur Radio activities and technology." The winner of a drawing for a $5000 grand prize certificate from the ARRL and R&L Electronics was ARRL Life Member John C Davison, N2OXV, of Poughkeepsie, New York. The winner of a $2500 gift certificate from the ARRL and FlexRadio Systems was Robert The, AC2II, of Germantown, New York. "Just before the prize drawing on Saturday afternoon, I invited the youngest hams at the closing ceremony onto the main stage," said Inderbitzen. "There were four 13-year-olds -- Stu Cichon of Meriden, Connecticut (a prospective ham); Dahnesh Upton, KB1OTB, of Mont Vernon, New Hampshire; Tobias Park, KD2EOM, of Warwick, New York; and Brandon Turrentine, KF5QYU, of Winnie, Texas. "Brandon pulled the tickets of the two prize winners," Inderbitzen continued. "Each of these young hams will be sent a hardcover edition of the ARRL Centennial Handbook signed by members of the staff, and some other 'goodies.'" At the convention, Craigie said, she saw some youngsters in strollers who likely will be around for the League's 150th anniversary in 2064. "Our job now is to do our part to make sure that Amateur Radio and the ARRL are strong for them when it's their turn to celebrate the next milestone in the history of our League," she said. 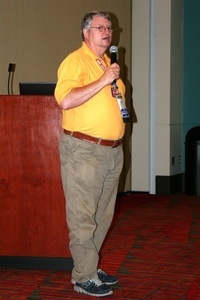 ARRL CEO David Sumner, K1ZZ, concluded the closing ceremony. 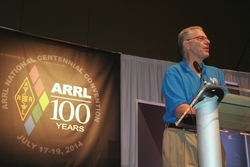 "With this moment, we say good-bye to ARRL's first century with fondness [and] great memories," he said. "You're all part of that history, and now we're all part of the ARRL's second century." 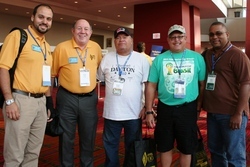 The just-concluded ARRL National Centennial Convention in Hartford, Connecticut, helped to infuse some energy into efforts to line up co-sponsors for "The Amateur Radio Parity Act of 2014" -- HR.4969. The measure, introduced in the US House of Representatives with bipartisan support in late June, calls on the FCC to apply the "reasonable accommodation" three-part test of the PRB-1 federal pre-emption policy to private land-use restrictions regarding antennas. The bill's primary sponsor is Rep Adam Kinzinger (R-IL). It received initial co-sponsorship from Rep Joe Courtney (D-CT). An additional four co-sponsors have since signed aboard the bill. 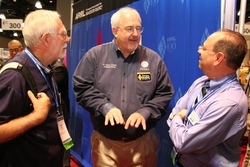 Courtney visited the ARRL Centennial Convention on July 19 to speak with League officials and those attending the event. At present PRB-1 only applies to state and municipal land-use ordinances, and the FCC has indicated that it will not act to provide the same legal protections from private land-use agreements -- often called covenants, conditions, and restrictions (or CC&Rs) -- without direction from Congress. 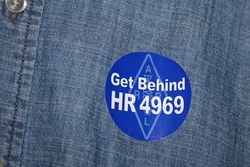 Convention visitors began sporting League-supplied "Get Behind HR 4969" stickers as the event shifted into high gear. Behind the stickers is a grassroots effort to encourage members to contact their congressional representatives to seek their support as co-sponsors for HR.4969. The effort at the Convention to entice visitors to sign letters to lawmakers yielded some 1400 constituent letters that will be hand delivered to members of Congress, a July 19 Convention Legislative Update Forum was told. ARRL Ge neral Counsel Chris Imlay, W3KD, said there already is precedent for the FCC to act. He explained that the Commission's so-called Over-the-Air Receiving Device (OTARD) rules currently preempt private land-use agreements to permit the installation of television antennas and satellite dishes. He suggested that making the leap to reasonably accommodating outdoor Amateur Radio antennas is within the FCC's regulatory scope, given the established strong federal interest in effective Amateur Radio communication. antennas or may only permit them with approval. He said that by 1990, some 29 million US residents were affected by private land-use agreements. "In 2011, that number changed to 62.3 million people," Imlay said. The goal, he explained, is to compel homeowner's associations to negotiate "reasonable accommodation" with an affected radio amateur. That could mean an outdoor wire antenna or something more elaborate; Imlay said it's not the intent of the bill to specify any particular type of antenna. 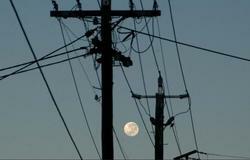 HR.4969 has been referred to the House Energy and Commerce Committee. Rep Greg Walden, W7EQI (R-OR), chairs that panel's Communications and Technology Subcommittee, which will consider the measure. The League had approached Walden, who helped to engineer the current legislation. "All [the bill] says is, take PRB-1, and apply it to all land-use regulation," Imlay said. "This couldn't be any simpler." Imlay said the bill faces opposition from the Community Associations Institute and an organization called Associa, which has suggested to Kinzinger that he "re-think" the bill. "We need to get a lot of co-sponsors for this bill," Imlay said. 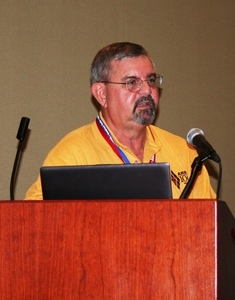 A principal proponent of HR.4969 is ARRL Hudson Division Director Mike Lisenco, N2YBB. "We are the ones who are responsible for our own future. The way to get things done is to be active on a grassroots level -- small scale," he told the gathering of about 50 interested radio amateurs. "This way you're dealing with your representatives as a constituent." Several forum attendees left early so they could visit the ARRL exhibit on the convention floor to obtain the necessary materials. ARRL Regulatory Affairs Manager Dan Henderson, N1ND, pointed out that the League has opened a HR.4969 page on the ARRL website. It contains information and resources for clubs and individuals wishing to support efforts to gain co-sponsors for the measure by contacting their members of Congress. It includes a sample letter to a member of Congress and a list of "talking points." Lisenco recommended organizing small teams of knowledgeable and articulate radio amateurs to approach lawmakers one to one to plead their case. Just prior to the Convention, ARRL President Kay Craigie, N3KN, released a video appeal to all radio amateurs to get behind a grassroots campaign to promote co-sponsorship of HR.4969. The ARRL and the Federal Emergency Management Agency (FEMA) have announced a Memorandum of Agreement (MOA) that will enhance cooperation between the League and FEMA in the area of disaster communication. 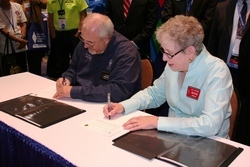 FEMA Administrator Craig Fugate, KK4INZ, and ARRL President Kay Craigie, N3KN, signed the agreement July 18 during the ARRL National Centennial Convention in Hartford, Connecticut. "Radio is one of the most resilient communications technologies we have," Fugate said. "When the power is out and telecommunications are down, the Amateur Radio community can serve as a vital resource in support of emergency responders and survivors during a disaster. This MOA will strengthen FEMA's partnership with ARRL and build upon our work to expand emergency communications capabilities and the use of Amateur Radio in emergency management." The new agreement will allow FEMA and ARRL to work together to provide resources, services and personnel, as available, in order to strengthen capacity in areas of emergency communications, mass care and emergency assistance, disaster preparedness, response and recovery, while also raising public awareness about the use of Amateur Radio as a public safety resource. The pact also outlines the ways in which FEMA and ARRL will cooperate to carry out their respective responsibilities, with respect to disaster mitigation, preparedness, response and recovery operations in the event of a natural or manmade disaster. Craigie said that from radio's earliest days of experimentation to the present, ham radio volunteers have combined a passion for technology with a devotion to assisting agencies that respond to disasters. "This combination of inventiveness and service has saved lives for a century," she said. "We look forward to working with FEMA to further develop opportunities for trained, equipped and prepared Amateur Radio operators to serve the public interest whenever and wherever disasters affect our country and its communities." Fugate echoed his afternoon remarks as the keynote speaker at the ARRL National Centennial Convention Banquet Friday evening. He said that before he even became FEMA administrator, it became clear to him that Amateur Radio could support ad hoc communication without relying on conventional communication systems. "The more sophisticated our systems become, the more fragile they become," he told the gathering of some 900 dinner guests. He again emphasized the need for resiliency in communication systems, and asked, "How many public safety networks can come close to ham radio's bandwidth?" "The relevancy of ham radio only grows," he asserted. "Amateur Radio is taking that hobby and turning it into saving lives." The FCC Enforcement Bureau came down hard on two radio amateurs this week, proposing substantial fines for alleged deliberate interference with other Amateur Radio communications -- in one case by transmitting music and animal noises -- and failure to properly identify. In similar Notices of Apparent Liability for Forfeiture (NALs) released July 22, the Commission proposed fining Michael Guernsey, KZ8O (ex-ND8V), of Parchment, Michigan, $22,000, and Brian Crow, K3VR, of North Huntingdon, Pennsylvania, $11,500. In both cases, the FCC said the evidence indicated that the transmissions at issue were aimed at interfering with other radio amateurs with whom each "has had a long-standing and well-documented dispute" that had spilled out onto the air. The FCC in both instances responded last March to "several complaints of intentional interference" on 14.313 MHz. Commission agents used radio direction-finding techniques to pin down the source of the transmissions. According to the NAL issued to Guernsey, the FCC agents monitored transmissions from his station for approximately 40 minutes on March 7, 2014, "and heard him transmit a pre-recorded song and various animal noises on the frequency." According to the NAL issued to Crow, FCC agents monitored transmissions from his station for approximately 3 hours on the morning of March 14, 2014, and heard him transmit slow-scan television (SSTV) signals and "a pre-recorded voice transmission of another amateur station on the frequency." "These transmissions prevented other amateur licensees from communicating over the frequency," the NALs said, adding that neither Guernsey or Crow transmitted their assigned call signs while the agents were listening. The FCC agents later the same day visited Crow's residence and asked to inspect his station, which they confirmed was capable of operating on 14.313 MHz. Crow denied operating his station that morning, however, and claimed that he was not at home when the interfering transmissions occurred. The Enforcement Bureau has warned both Guernsey and Crow in the past regarding interference to other Amateur Radio operators. In Crow's case, the FCC said the fact that he subsequently interfered with other amateur operators "demonstrates a deliberate disregard for the Commission's authority," and warranted an upward adjustment of $3500 to his proposed base forfeiture. Guernsey first came to the Enforcement Bureau's attention in the late 1990s and, the FCC said in the NAL, "has a history of causing interference to the communications of other Amateur Radio operators and has been warned repeatedly in writing." Guernsey's lengthy history with the Commission warranted an upward adjustment of $14,000 to his proposed base forfeiture. The Commission gave both licensees 30 days to pay their fines or to file written statements "seeking reduction or cancellation of the proposed forfeiture." The NALs to Guernsey and Crow came in the wake of a June 5 Notice of Violation (NoV) alleging that Thomas Ryan Price, W7WL, of Sweet Home, Oregon, caused malicious interference to other radio communications on 3908 kHz, transmitted music on the same frequency, and failed to properly identify. The ARRL Volunteer Examiner Coordinator (VEC) administered several Amateur Radio examination elements to applicants at Amundsen-South Pole Station in Antarctica -- the home of KC4AAA. The examination was the first administered under new FCC rules which became effective on July 21, permitting VECs to administer Amateur Radio examinations remotely. "All six candidates earned a new or upgrade license," said ARRL VEC Manager Maria Somma, AB1FM. There were three new Technicians, two upgrades to Amateur Extra, and one candidate who went from unlicensed to Amateur Extra." Joe Musachia, W5FJG, served as the volunteer examiner at the South Pole, while Penny Harts, N1NAG, and Rose-Anne Lawrence, KB1DMW, were the VEs at ARRL Headquarters. "Chet Waggoner and Bartley Davis are the first at the South Pole and possibly on the continent to pass the General exam," Musachia said in a posting on the ARRL Facebook page. Two previous exam sessions were held at the South Pole, but special permission from the FCC was required to conduct them. The logistics were somewhat daunting, since the video link required a satellite connection and clearance from NASA, and it was subject to possible last-minute changes, should the International Space Station require additional Satcom time. Musachia, who is the satellite engineer at the station, said NASA was aware that the VEs had requested a large block of time to perform the exam session and did not change it. 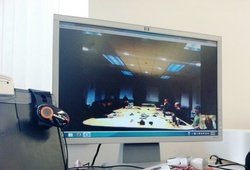 Somma said the video exam session went ahead as scheduled on July 22 at 8 AM EDT, which was 8 PM in Antarctica. "The summer day was a pleasant 80° here at Headquarters in Newington, while in Antarctica it was 80 below!" she pointed out. Read more. The ARRL Centennial W1AW WAS operations taking place throughout 2014 from each of the 50 states now are in Indiana and Rhode Island. They will relocate at 0000 UTC on Wednesday, July 30 (the evening of July 29 in US time zones), to South Dakota (W1AW/0) and Kentucky (W1AW/4). During 2014 W1AW will be on the air from every state (at least twice) and most US territories, and it will be easy to work all states solely by contacting W1AW portable operations. The ARRL Centennial QSO Party kicked off January 1 for a year-long operating event in which participants can accumulate points and win awards. The event is open to all, although only ARRL members and appointees, elected officials, HQ staff and W1AW are worth ARRL Centennial QSO Party points. Working W1AW/x from each state is worth 5 points per mode/contact, even when working the same state during its second week of activity. The ARRL has posted an ARRL Centennial QSO Party leader board that participants can use to determine how many points they have accumulated. While Bill Eberle, AB0MY, of Boulder, Colorado, and his wife Mary were hiking in the back country on July 21, they encountered a team of paramedics rendering aid to a 67-year-old man -- Michael Schuett, of Broomfield, Colorado -- who had lost his footing while crossing a stream. Schuett had struck his head on a boulder and was found unconscious and face down in the water by another hiker, who had pulled him to safety. The paramedics, en route to a youth camp, also had stumbled onto the scene. Lacking cell telephone coverage, Eberle put out a distress call on the hand-held transceiver he always takes along when he hikes. Promptly answering his call on the statewide Colorado Connection Repeater system was Ryan Frederick, KD0TSZ, in Colorado Springs. Frederick contacted the Boulder County Sheriff's office. Authorities quickly turned to Scott Whitehead, KA0QPT, of Longmont, a sheriff's department radio specialist and 30-year veteran of the Rocky Mountain Rescue Team. Whitehead was able to contact Eberle via the repeater network, and the two coordinated equipment and rescue personnel. A Cincinnati, Ohio, broadband-over-powerline (BPL) Internet service provider is throwing in the towel and yielding to more modern technology. Cincinnati Communications will pull the plug on its BPL system on August 1, according to a report on The Enquirer newspaper's Cincinnati.com website. "The failure of the Cincinnati system will come as no surprise to anyone familiar with BPL technology," ARRL CEO David Sumner, K1ZZ, commented. "It's rather remarkable that they managed to keep it going this long." Thomas Balun of Broadband Ventures LLC, which operates Cincinnati Communications, told The Enquirer that the company essentially would be starting over from scratch with more up-to-date technology. "The technology to subscribers' homes was really antiquated," Balun told The Enquirer. "We tried to figure out how to convert subscribers, but we can't do it. We have to shut the system down and start over." The Enquirer report said Cincinnati Communications customers had endured "on-again, off-again service" with the BPL system, with some service outages lasting for days. Balun conceded that the technology "was painfully slow," the Cincinnati.com report said, and the company plans to upgrade to an optical fiber system. The Cincinnati system was never a significant source of interference to radio amateurs, Sumner said, because it used Current Technologies hardware. "The medium-voltage lines used low-band VHF frequencies," he explained. "The drops to homes used HF, but with the ham bands notched." Read more. 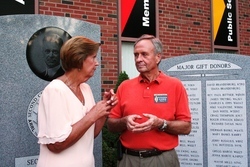 the right side of the main entrance was dedicated on July 17 at a ribbon-cutting and reception held in conjunction with the ARRL National Centennial Convention. 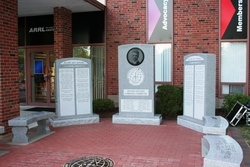 The Centennial Terrace features an impressive central granite pillar bearing the visage of ARRL Co-Founder Hiram Percy Maxim, W1AW, and the names of the ARRL Second Century Campaign (SCC) Committee, chaired by David Brandenburg, K5RQ. The central pillar, which also displays the SCC logo, is flanked by two granite panels. Engraved on these are the names of those who contributed major gifts to the ARRL Second Century Campaign. ARRL President Kay Craigie, N3KN, told the gathering of about 200 that contributing to the Second Century Campaign "is not so much a donation to the ARRL as an investment in the future of Amateur Radio." "We are the conduit. We are the means. Amateur Radio is the end," she added in thanking all contributors. The permanent installation is a means to "make sure that future generations remember your generosity," ARRL CEO David Sumner, K1ZZ, said. ARRL Chief Development Officer Mary Hobart, K1MMH, hosted the gathering, which Sumner called "bittersweet," since Hobart is stepping down at the end of July to retire. "We'll miss her tremendously," he said. Sumner said the Centennial Terrace dedication and the convention are "a part of the history of Amateur Radio," which, he continued, would have ended long ago had it not been for "the vision of the founders of this organization." "The only way we have to repay that debt is to pay it forward to the future to make sure that Amateur Radio and the ARRL as the defender and supporter of Amateur Radio, are here long after we're gone." Donors to the campaign "now are a part of the ARRL's history and of Amateur Radio's history," he concluded. Brandenburg said he stepped up to chair the Second Century Campaign Committee because he felt a need to help those coming into the hobby in the same way he was helped when he got into Amateur Radio when he was 14. "For everybody here," he said, "ham radio is a big deal to us, and it's very important to us that we keep it going." Sumner predicted that when the week was over, there would be two groups of radio amateurs: Those who attended the ARRL National Centennial Convention and those who wish they had. Among the things the Amateur Radio community can count on in its second century, according to Nobel Laureate Joe Taylor, K1JT, is that ham radio will continue to thrive and serve the public interest. 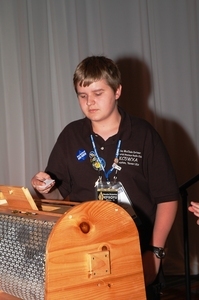 While his primary topic at his standing-room-only presentation on July 19 during the ARRL National Centennial Convention was "DXing with Weak Signals and Beyond," Taylor -- who detailed the development of his WSJT suite of "weak-signal" DSP software -- also broke out his crystal ball. "Radios are going to become increasingly digital," he said, with analog-to-digital and digital-to-analog conversion occurring "closer and closer to the antenna -- in fact, pretty much at the antenna can be done already." Taylor also said that in the future, good engineering will definitely be a combination of hardware and software. Beyond that, he said, science, technology, and Amateur Radio will continue to benefit from a healthy cross-fertilization between amateurs and professionals. "I know that is true in my own case," said Taylor, whose interest in Amateur Radio at a young age helped guide his career path. "My own boyhood fascination with the art and science of radio got me into this hobby, and, from there, it launched me on a path leading to advance degrees in physics, to teaching university physics, to making fundamental research contributions to mankind's knowledge of the laws of nature," Taylor told the rapt audience. Taylor recounted that in Amateur Radio's infancy, scientists of the day did not believe short wavelengths could support useful communication. The government listened, and gave that part of the spectrum to hams, who soon proved them wrong. "The experts truly were astonished," Taylor said, exhorting his listeners to make whatever contributions they can to the art and science of radio and to the public good. "It's a great story and it couldn't have happened the same way without the ARRL," he continued. "Let us also work to keep our League a strong and effective voice on our behalf. I'd like to think that someone will be here100 years from now looking back fondly on all the good things accomplished by Amateur Radio during ARRL's second century." Despite efforts to keep the flagging VUSat OSCAR-52 (VO-52) Amateur Radio satellite in operation for a while longer, ground controllers have yielded to the nearly decade-old spacecraft's failing technology and have permanently taken it out of service. Launched into low-Earth orbit in 2005, the VO-52 microsatellite carried two Amateur Radio transponders for SSB and CW. B.A. "Mani" Subramani, VU2WMY/KJ6LRS, of the Indian Space Research Organisation (ISRO) said that VO-52's lithium-ion batteries had failed, and the satellite was officially decommissioned on July 21. Read more. During the decade of the 1960s and subsequently, Gus Browning, W4BPD, traveled the world and operated from over 100 countries, many of them extremely rare ones and sometimes the first ham operation for that country. Gus was an ordinary guy, always a gentleman, and an unflappable pileup operator. He was the first DXer elected to the DX Hall of Fame. 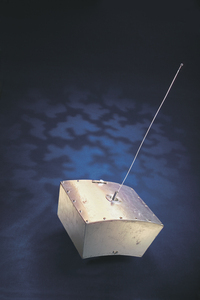 An ARRL prototype of OSCAR 1. On December 12, 1961, OSCAR 1, the first Amateur Radio satellite, was launched into orbit. OSCAR 2 followed on June 2, 1962. Both paved the way for the amateur satellites that followed. By 1963, the US ham population had reached a quarter of a million, although at that time there were more CB operators than hams. During the 1960s, repeater operation began on 2 meters. At first, there was a fair amount of confusion -- questions of legality had to be sorted out by the FCC, a lot of hams thought channelized operation wasn't a good thing, equipment had to be developed, etc. But eventually things settled down, and repeater operation on 2 meters took off, with repeater operation on other VHF/UHF ham bands and 6 meters soon to follow. On March 27, 1964, a magnitude 9.2 earthquake and the resulting tsunami struck Alaska and caused extensive damages in many parts of the state. As in most natural and man-made disasters, hams were quick to put together emergency communication links to help with disaster relief. Tad Cook, K7RA, in Seattle, Washington, reports: On Thursday, July 17, there were no sunspots at all! This serves a sobering reminder of how weak this solar cycle is. By July 23, new sunspot regions had emerged and the sunspot number was 55. 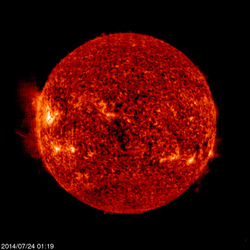 Solar flux ranged from a low of 86.1 on July 19 to a high of 99.1 on July 23. Predicted solar flux for the near term is 100, 105, and 115 on July 24-26, 125, 140, and 155 on July 27-29, 170, 160, 150, and 155 on July 31 through August 2, 150 on August 3-5, then dropping to 85 on August 18, and rising to 150 on August 29. The planetary A index was quiet over the past week, and it's predicted to be at 5 on July 24, 8 on July 25-26, 5 on July 27-28, 12 and 10 on July 29-30, 5 on July 31 through August 4, 8 on August 5-6, 5 on August 7-9, 8 on August 10-11, then 5 on August 12-16, 8 on August 17-18, 5 on August 19-20, and 10 and 8 on August 21-22. In tomorrow's bulletin look for an updated forecast and reader reports on 6 meters, HF conditions and the usual fear and loathing concerning weak solar activity. Send me your reports and observations.